Of all the things to do in Trieste, from luxurious cake to literary history, grand architecture to brutal history, I found myself thinking about the edge of the old Iron Curtain and the melting of the Cold War. 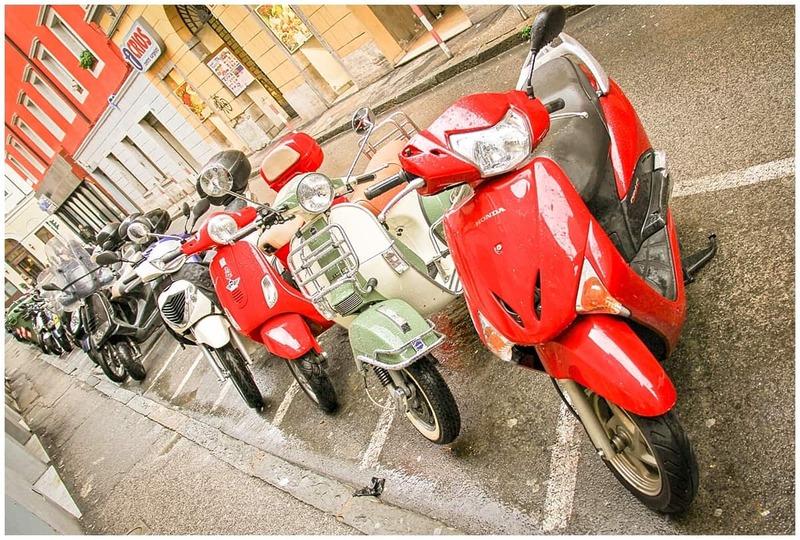 This article covers both classic and unusual things to do in Trieste as a thoughtful traveller. It also glimpses into its soul, and mine at the time and project where I found it. 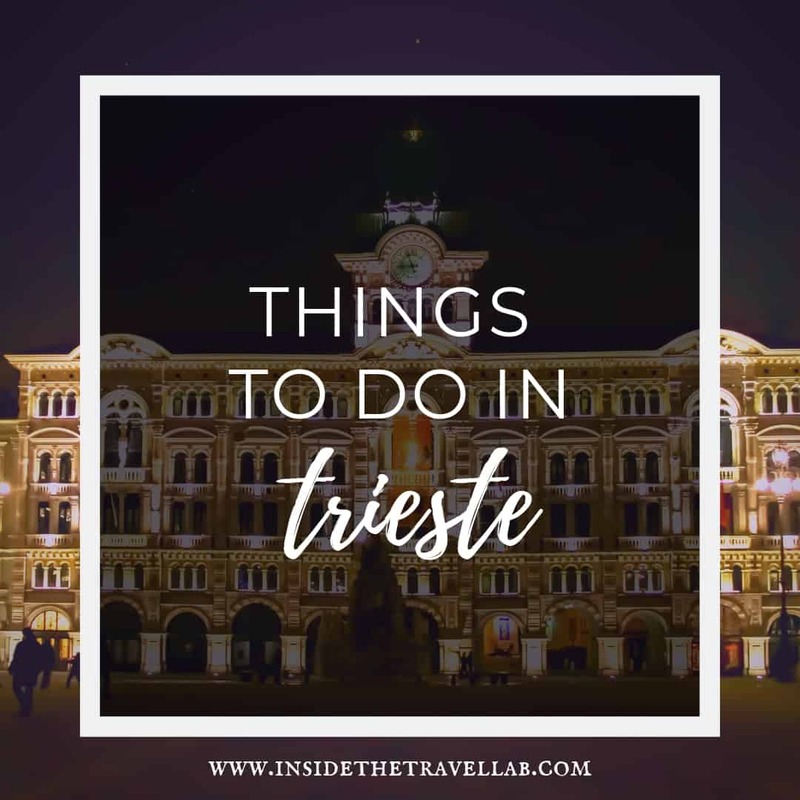 For a quick overview of things to do in Trieste, check out the highlights box below. Use the table of contents to navigate to more useful in-depth points on each of the places. And read the middle section for the all-important background on the city and its place in the tumultuous 20th century. Where is Trieste in Italy? A central square with a name like Piazza d’Unita d’Italia already invites questions. A mention in a landmark Churchill speech becomes an informal visit to help the police with their enquiries. By the time I was translating the Italian word for sauerkraut (crauti) while sitting in the century-old beloved Buffet da Pepi, historical questions had become a caffeine-fuelled double cross-examination in a hyped and highly-televised celebrity trial of the century. Just who or what was Trieste? What was the former Iron Curtain? And why didn’t I already know about this fascinating, fantastic place? First things first. 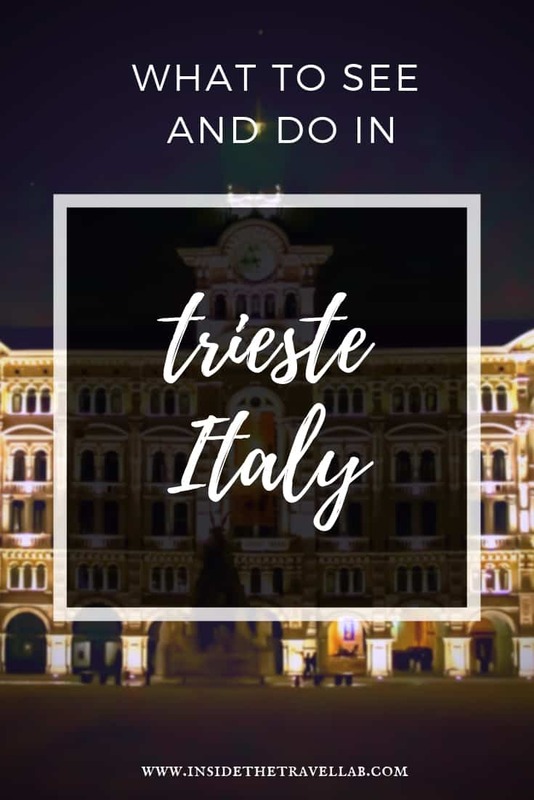 Trieste lives in the northeast corner of Italy, a short train ride away from the not-so-well-kept-secret city of Venice. One hundred years ago, it belonged to the Habsburg Empire. The Habsburgs (in case, like me, you never covered any of this in school) ran and oversaw an empire that stretched from Holland to the subsequent USSR and lasted for more than 600 years. 100 years after their demise, hardly anyone knows who they are. Today's grandchildren never knowing there was a Queen of England. Trieste formed the Habsburgs’ 4th largest city, right behind Vienna, Budapest and Prague. World War One began with the assassination of the heir to the Habsburg throne. And as World War One ended, so did the Habsburgs. A victorious Italy moved into Trieste, Slovene names were switched to Italian and the decades that followed involved ongoing border disputes, forced Italianization, Nazi occupation, the decimation of the Jewish population and the formation of the only concentration camp on Italian soil. Landing on the losing side once again, at the end of the Second World War, Trieste “belonged” to the Allied Forces. Its territories were split once more and within a few years it settled into the borders it uses today, snug against what used to be western Yugoslavia, and what is now 21st century Slovenia. And, according to Churchill’s speech in 1946, at the edge of the Iron Curtain. He was talking about the political divisions that had appeared in the immediate aftermath of World War Two. Yet that border with Yugoslavia was different. The Iron Curtain with modern-day Slovenia was less, well, iron, more semi-permeable but tough goretex. But the situation with Slovenia and Yugoslavia is one to explore another day. Now I’m watching the waves of the Adriatic as they approach the shore of Trieste. I’m smelling fresh and salty air and thinking of dinner. I’m looking for Viennese-style coffee shops and lard-soaked pizza; historical sauerkraut and slices of pork; a Garden of Remembrance and the inspiration for James Joyce. I’m looking for Italian and Slovene, Habsburgs and happiness, Cold War and warm peace. I am, I suppose, looking for Trieste. Behind me, I know that sapphire lights stud their way across the stone. Right now, though, I’m watching darkness. Behind me, flames from an occasional car streak across the empty velvet sky, backlit by the brilliance of a long forgotten empire. Ahead I see nothing. Black, dark, empty, silent. Just the sound of water touching the stone that leads from the Piazza d’Unita d’Italia to the edge of the Adriatic. I am standing in Trieste, in Italy, and I am thinking about the Iron Curtain, the driving force for my current #ironroute trip. Really, this is the best thing to do in this grand, imposing yet full-of-quiet-alleyways Italian city. Start at the waterfront and follow the waterways in and back to the Adriatic. Climb hills. Meander in coffee shops without a plan at all. Look up at grand facades and out again to the sea. I'll sketch out more of a plan for you to guide your way, but always remember this: the best thing to do in Trieste is to explore with your feet and with your stomach. Head to the waterfront and walk around the old part of town without a plan. Coffee. Cake. Walking. All good, so good. Mixing all the romance of Vienna's coffee shops with Dublin's literary history is the Caffe Tommaseo, a cosy spot that serves a lot of cream with its coffee. All polished wood and cream with a smoky, old fashioned feel, it's the exact antithesis of the bright white, ceramic tiled hipster coffee bar of today. It opened in 1830 and claims to be Trieste's oldest cafe still in operation. Today, though, it's a spot for hiking and walking off that cake. Local tip: take bus no 4 from the centre to start the hike to Prosecco. The Posto delle Fragole, or strawberry patch, is a restaurant, bar and cultural centre surrounded by parkland in Trieste. But it used to be the city's psychiatric hospital. Trieste was the first Italian city to end the forced incarceration of people with mental illness and students now throng here, mingling between the buttery yellow walls. In summer, I'm told concerts take place between the rose gardens. Top tip: bus 12 from the city centre will whiz you along to the rose gardens and park. Besides the stunning waterfront architecture, the best thing for me about Trieste was understanding her history through her food. So much so, I wrote a whole article about Trieste cuisine in particular. The switch from Austro-Hungary to Italy has never been more evident than on a plate. And the most striking example, particularly if you're more used to the Italian side of the menu, is the Buffet experience. Casual yet sacrosanct, it's a style of eating where everyone rubs shoulders with everyone else and huge hunks of ham and pork legs are sliced into mustard-rich platters. This isn't the cured, slender, parma ham world. It's the chunky, juicy, slabs of meat with sauerkraut world. And it's delicious! Top tip: Visit Buffet da Pepi on Via della Cassa di Risparmio, 3, 34121 Trieste for the real deal. To add a bit of structure to your walk, head to the lighthouse or Faro della Vittoria. The 70 metre structure has all the hallmarks of empire building and glory but it's come to represent a symbol of liberty for the people who live here. Although run by the navy, it's open to the public and promises panoramic views across to Slovenia and Croatia. A view that bound families together during the political separation. Top tip: find the lighthouse on Gretta Hill on the foundations of Austrian fort Kressich. You wouldn't think it to look at it, but this impressive waterway stands on the ground of reclaimed salt marshes. Built in the 18th century, the canal was a key part of reinventing the city. And while it lacks the iconic grandeur of Venice, it gains a sense of authenticity. You won't find Trieste crowded out with tourists. Right in the heart of Trieste lie the ruins of a Roman Theatre. A reminder, if one were needed, that this crossroads of Europe has changed hands many times. It's a steep old hill that leads to San Giusto Castle, as befits a spot for fortification. Even before the Romans arrived on this part of the Adriatic coast, this part of the city was involved in defence. The current castle, built in 1468 by Austria, never needed to sully its hands with the mucky business of actual military campaigning. And so it still stands today. Top tip: again, save your time if needs be for the coast. And so we return to the grandeur of Trieste in Piazza della Borsa, close to Piazza d'Unita d'Italia. The columns of the Chambers of Commerce. The grand facades of the square. The pedestrian area now a mix of work, play and dreamy looks back at history. Insider tip: Pull up a chair and have a coffee. It's not just because I'm tired. This is coffee success story "Illy's" homeland, don't you know? This article forms part of a series for #ironroute, a journey by train from Istanbul to Berlin. This took place thanks to the sponsorship, freedom and encouragement of InterRail. Plenty of great insights into the history of this region. I never knew Trieste had been such an important Habsburg stronghold. I guess it really is the southern tip of the old divide of the two Europes that existed until the end of the 1980s. One historical note. The Soviet Union may have been late into WW2 in terms of fighting with the Germans but they marched into Poland only two weeks after the Germans did, back in 1939. They ‘liberated’ the east of the country under the terms of the secret non-aggression pact between Hitler and Stalin that carved Poland up between its two giant neighbours. Thank you. It was a tough one to write! Great story and I love that last photo- so much energy and excitement in it! Thanks. Ideally, I wanted a full sweep of car headlights running across the frame but Trieste in December simply doesn’t have enough traffic! Great info and love the night photos. Good info on this place, great learning for my first day of 2012! I will blame it on my North American citizenship but I know absolutely nothing about Slovenia, I’m really looking forward to more of your #Ironcurtain stories to fill in the gaps. When ever i go to Italy I always think about a few day stop in Germany but after reading this article I think I should start planning a trip there. It is just hard sometimes to try something new when you know what you like. Well that’s why Trieste is such an interesting compromise ;) It’s in Italy yet you get a taste of several other cultures as well! Great history, beautifully written and thought-provoking. Nice story Abi, and of particular interest to me as I was born in Trieste, but have lived my adult life in Sydney, Australia. Have been back to my p.o.b. many times and it certainly is a place like no other…some Triestines don’t even consider themselves Italian! One of the things I miss most is the great coffee. You CANNOT get a bad coffee in Trieste. In fact, I wrote a piece about the Trieste coffee connection for a local magazine ‘Italianicious’ this month. Hope you enjoy it. Hi again, re above story on Trieste, here’s the link to the page above. Hi Ambra – links tend to get stripped out to prevent spam. I’ll agree with you over the coffee, though (and the cake.) Delicious! Have you read ‘Trieste and the Meaning of Nowhere’ by Jan Morris? She often wrote about Trieste and lists it as her favourite city. No – or at least not yet. I will add it to my list, though as the city has such an interesting past. Agree. It’s a great read. Jan Morris also included Trieste in her 1980 book “Destinations”(Essays from Rolling Stone).